By training the next generation of utility workers so that they and we are prepared to upgrade and maintain our gas and electric infrastructure, PG&E is helping to build the workforce that will power California’s future. Our workforce development strategy reflects industry needs, leverages public-private partnerships and reaches out to underserved communities to attract qualified and diverse candidates from our communities for local jobs. Utilities nationwide face a shortage of skilled workers and trained professionals to meet the growing industry demand. In response, we are conducting strategic outreach, engagement and training to create a qualified and sustainable pipeline of candidates for PG&E. 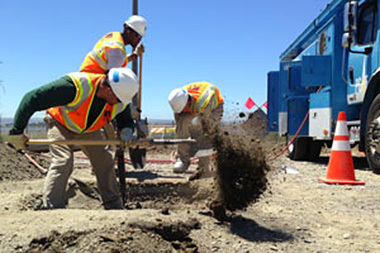 PG&E partnered with the Cypress Mandela Training Center in Oakland to provide gas pre-apprentice training. Fifty-five students have graduated since the program’s inception—and nearly half were hired by PG&E. PG&E’s PowerPathway™ program is a core component of our workforce development strategy. Through PowerPathway, we collaborate with local community colleges, community organizations, the public workforce development system and PG&E leaders to enlarge the talent pool of skilled and diverse workers needed by PG&E and our peers in the industry. Students receive an industry-informed curriculum that equips them with the academic, vocational and physical skills needed to compete for entry-level employment. PowerPathway was designed to help people who are out of work or underemployed. Since its inception in 2008, the program has produced qualified graduates for our own hiring pipeline who have gone on to support the economic vitality of our local communities. PG&E has been a strong supporter of training and hiring veterans and recognizes the invaluable skills and perspectives they can offer companies looking for mature, highly qualified employees. More than 1,000 employees, both veterans and those who support them, are part of PG&E’s Veterans Employee Resource Group. We continue to make progress in helping veterans escape long-term unemployment and have partnered with other businesses and President Obama’s administration to develop best practices for hiring and recruiting the long-term unemployed. Our recruiting strategy involves extensive community diversity outreach. In 2014 alone, our recruiting staff attended three national diversity recruiting conferences and approximately 23 on-campus recruiting events for university students, giving them the opportunity to speak with our employees and learn firsthand about PG&E. More broadly, we also use LinkedIn and specialized, targeted online job boards to advertise career opportunities and source candidates. We also offer summer internships and entry-level engineer and other rotational programs for recent college graduates to introduce young professionals to new work experiences and career development opportunities. At our three training centers, PG&E offers a variety of education and training programs in energy efficiency for building professionals, including architects, designers, engineers, contractors and technicians. The Energy Training Center in Stockton, the Pacific Energy Center in San Francisco and the Food Service Technology Center in San Ramon offer specialized classes on topics such as residential building weatherization, constructing and maintaining energy efficient commercial buildings and energy performance in commercial kitchens. PG&E also offers a Tool Lending Library that loans building-measurement equipment at no cost to anyone working on short-term energy efficiency projects. 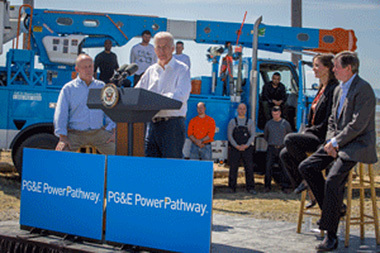 During a visit to a PowerPathway training class in Oakland, Vice President Joe Biden described the program as “the framework for a lot of other big companies, not just utility companies” for workforce development. Successfully championed initiatives for the long-term unemployed. This included conducting two PowerPathway programs in California’s Fresno region that focused on long-term unemployed veterans. Also, PG&E and the U.S. Chamber of Commerce co-sponsored a Fresno Hiring Our Heroes event where about 30 employers, including PG&E, met with more than 100 unemployed veterans looking for a new career. Developed and executed training programs in Fresno, Oakland, Sacramento and Lemoore geared toward military veterans and women, as well as specialty courses on climbing power poles and welding. Other courses focus on electric line work and gas utility work. Earned recognition as one of the country’s top 100 military-friendly employers for the third consecutive year and fourth time overall. This ranking from G.I. Jobs Magazine is based on the strength of military recruiting efforts, the percentage of new hires with prior military service, and the retention programs and PG&E policies on National Guard and Reserve service. PG&E increased its ranking to No. 70 nationally. Hosted technology showcases. PG&E hosted two technology showcases at the Pacific Energy Center, where customers learned about the latest products and technologies for lighting and water conservation. 224 PowerPathway graduates hired by PG&E since 2008—with a 98 percent retention rate after six months. 99 PowerPathway graduates trained in 2014. 60 percent of participants from underrepresented communities. PG&E also helped architects and other building professionals gain new skills and expertise in energy efficient design and construction at its three training centers, holding more than 350 training sessions in 47 cities and providing 1,200 technical consultations. 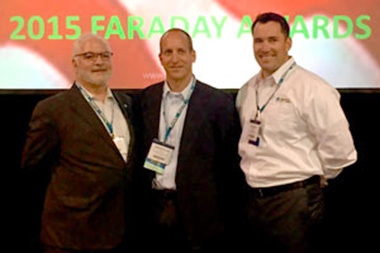 PG&E earned the Faraday Award at the annual Electric Power Conference. The award honors corporations that have successfully connected, employed and engaged veterans to become long-term employees in the power industry. Our workforce development programs will continue to focus on recruiting and training talented employees to address the shortage of skilled workers in the utility industry. Among many initiatives, PG&E is creating new approaches for direct hiring to help increase the likelihood that PowerPathway™ participants are hired upon completion of training. Another initiative involves launching a pilot program to recruit veterans as customer service representatives. PG&E is also creating an opportunity for PG&E Energy Academy graduates from Foothill High School (Sacramento) and the Venture Academy Family of Schools (Stockton) to participate in PowerPathway to receive hands-on job training in the utility industry.